The SESDA Heliophysics group was involved in numerous paper and poster presentations at the American Geophysical Union (AGU) meeting in New Orleans Louisiana in December 2017. 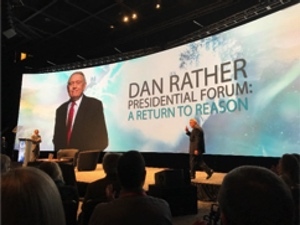 The meeting was marked by a keynote speech by veteran news anchor Dan Rather. The group’s presentations spanned a diverse range of topics that included: highlights of the 2017 Total Solar Eclipse across America which was the most viewed eclipse in history; 3D visualization of the Sun using observations from the upcoming Parker Solar Probe and Solar Orbiter missions; a community-developed open-source Python software library (SunPy) for analyzing solar data; the novel detection of quasi-periodic pulsations in the Earth’s ionosphere that are synchronized with solar activity; and anticipated results from the FOXSI SMEX mission that combines state-of-the-art grazing-incidence focusing optics with pixilated solid-state detectors to provide direct imaging of hard X-rays in solar flares.